A new photo has been added to retouching portfolio today. Actually it’s from an old photoshoot for Inspire volume 2 that didn’t make the cut, but I knew one day I would come back to it. Certain lighting can accentuate unwanted features on a model, thankfully some clever retouchers created and coined the term “frequency separation” to make jobs like the one below a lot easier. The technique seems to be an expansion off of the popular highpass sharpen technique that I had already come to love using in a lot of my work. 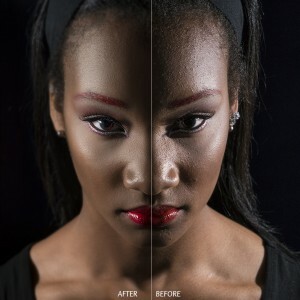 A before and after split is shown below, to see the full retouch job visit my portfolio retouch section.